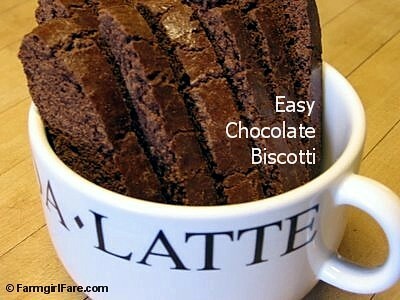 Homemade chocolate biscotti makes a delicious holiday gift (recipe here). Looking for a last minute holiday gift idea? Think homemade biscotti! I've been making and giving (and eating) this Easy Chocolate Biscotti for over 15 years, and it's always a huge hit. It really is an amazing recipe and foolproof, too. Highly recommend trying it out! This will be a wonderful addition to coffee in the morning; I went back to look at the 2005 post with the recipe and it looks pretty easy.